A Review of The MOPC Plate Carrier From Condor – Will It Save Your Life? Today we’re going to take a look at and provide a full review of the Condor MOPC, and for those of you that didn’t know, MOPC stands for Modular Operated Plate Carrier. What’s This Modular Thing About? Essentially what this modular system means is that it is utilizing the PAL system, so any Molle attachment on the market right now would be compatible with the Condor MOPC with no problems. This goes for pretty much all of the Condor range of gear. So, we will start from the top of the MOPC where we have some really nice pads on the shoulder straps, which is usually my first complaint with plate carriers, because typically they’re really cheaply made and the padding on the straps is a waste of time, which can cause they can cause lots of neck strain and shoulder strain when you’re using it. However, on the Condor I am really happy with the quality and the comfortable fit these straps provide. Moving down this rig has a row of molle webbing which is covered by a velcro patch, which is affixed along both on the top and the bottom making is super strong. Then there is a standard row of molle beneath this velcro, which essentially means that if you didn’t want to use an admin pouch you can simply use the velcro or indeed your own velcro patches which would fit over the plate carrier. Things such as flags or morale patch or anything that you guys choose, which makes this great for tactical use and even airsoft. Moving further down the mopc, underneath the velcro and plate section we have a tab which holds a hydration tube and beneath this, we have an integrated map pack, which has a really heavy duty layer of velcro and also sturdy buttons which keep the pouch shut. In this pouch you can obviously store maps, however, it is also suitable for food or anything that you need easy access to such as a single stacker mag pouch, which could fit neatly inside this pouch instead of having one on the outside. This would keep the front really low profile so it’s definitely an option. Personally, I would just utilize the molle attachment points that it comes with, but if you wanted to you certainly can fit a mag pouch in here. As standard, the Condor Outdoor MOPC comes without any pouches. This is so that you can customize your setup as you see fit, depending on your activity and use. As I mentioned above, we have a lot of the standard molle wedding on this rig which gives us plenty of space. It is here where I keep my triple mag shingle, which consists of 3 pouches across the front each holding 1 magazine. I like to remove the cover button on these pouches for quick and easy access. I find that using the shock cord and toggle to snap over the mag a better option and a more convenient one. 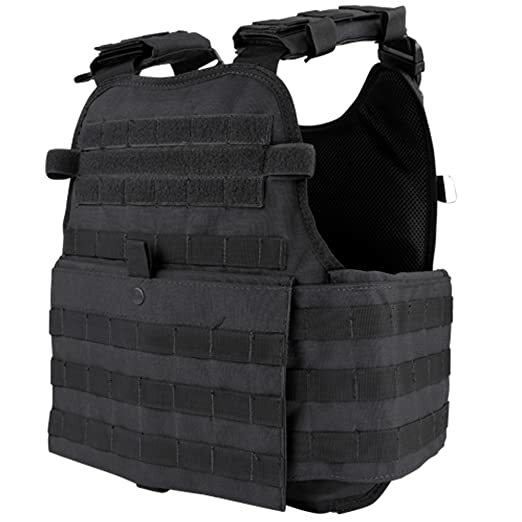 The last thing to mention on the front of this plate carrier is that there’s a tab of webbing which fastens to the back of the front pouch section, which, when unbuttoned it allows you to whip up the entire front section to release your cummerbund. Last, of all for the front and the back of this plate carrier, you can they do accept SAPI training/dummy plates, so if you want to get an even more realistic look you can add those and that adds more rigidity to the entire set up. Turning the vest to the side and the main thing I really want to highlight is with the cummerbund, there’s the option to fit ballistic plates that cover both sides of your plate carrier. I haven’t really found anything like that for dummy purposes or airsoft but side plates are not really needed for this and would just add to the expense. I would simply add additional side pouches on either side, which covers where the side plates would be. In which you can store your tools etc. Either way, the pouches are pretty thick and the padding on the side cummerbund is really nice. One key feature is that on the inside of the cummerbund there is a clip system, which, if you wanted to be agile and high-speed, could actually be used to remove the cummerbund completely and you would just use the clip system which will keep the pouches and all of your gear on you. Back up at the top of the rig on the shoulder straps, we have two heavy duty buckles which are great for rapid release of the plate carrier itself. It also has a double stitched drag handle, which comes in handy since when this rig is fully loaded it can really weigh a lot, so having another way to carry it comes in handy. Just like we have on the front, there are two layers of MOLLE webbing that also have the velcro system, so you can put on patches, callsigns and things like that. Wrapping it up, that’s pretty much it for our Condor MOPC Review, it’s a very simplistic rig which is suitable for beginner to intermediate users of plate carriers and even for some of the more advanced users, it’s definitely a decent carrier. Not only does it have a lot of Molle space, you can customize it really well and get it all kitted just the way you like it. Color wise, it’s available in Black, Coyote Brown, Olive Drab and Multicam.